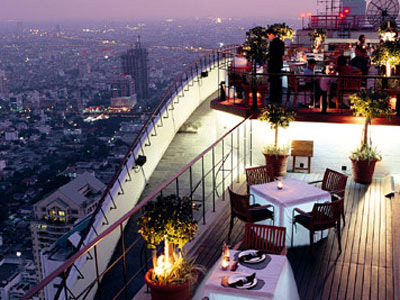 The Vertigo Grill and Moon Bar is located 61 floors above the streets of Bangkok on the terrace of the Banyan Tree Hotel. From here you can gaze upon the city, through the provided telescopes if you like, and enjoy some jazz music with a glass of bubbly in hand. Perfect for a romantic rendezvous. The food is a mix of BBQ specials that include oysters and scallops. The signature dish is their Sea food platter for two, stylishly presented on a two tier silver tray with a selection of Tasmanian Oysters, Phuket Lobster, giant p rawns and mussels on a bed of crushed ice, served with garnishes of chopped red shallots and freshly made mayonnaise a feast for anyone with a penchant for maritime fare. This is truly a venue that will take your breath away.